Toy Defense Game - Download and Play Free Version! Command your Troops and Defend your Base Against Oncoming Enemy Soldiers! What child didn't want to play with toy soldiers when they were young? Now the thrill of commanding an army has come to your hands in Toy Defense. 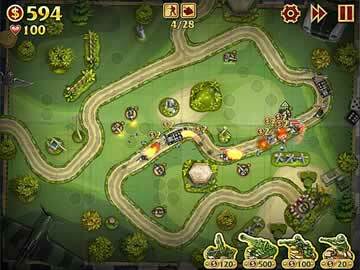 Let your imagination run wild and control the placement and rank of your soldiers as they fight off wave after wave of enemy troops. Don't let them reach your home base or it's all over! Toy Defense is a simple game. You, the player, are a child playing with your toy soldiers. 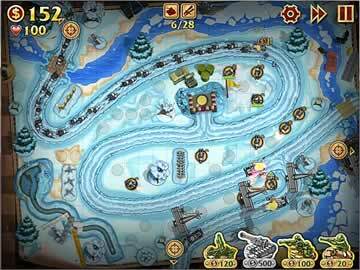 Your battlefield is a track on which enemy troops flood to attack your home base at the end. You place your own soldiers in true tactical military command style, spending your money to buy more and upgrade your existing soldiers as you go. Pit your defending army against the attackers. World War I is the stage set for battle. The oncoming troops use old style technologies, from slow bombing planes to foot soldiers with hand grenades and trundling armored tanks. Meanwhile you defend your position with riflemen, flamethrowers, anti-air batteries and armor-destroying cannons. You're in complete control of the placement of your troops and the allocation of your meager funds. Scarcity is the name of the game, and you're always fighting to stay alive and earn the money you need to successfully defend yourself. Toy Defense is a tower defense game, through and through. Each map is a toy field of hills and valleys with a line of roads paved through it. Enemy soldiers file along these roads, whether it's one single path or multiple branching trails. Their goal is to successfully follow the road from their entrance to your command center. Your goal is to stop them at all costs. You place soldiers in fixed positions around the roads. At first you can only afford riflemen, who fire quickly but lack the damage to destroy more than the normal foot soldiers. Eventually you can work up to placing flamethrowers, who are adept at taking out groups of enemies but have a very short range. Later on you may need to hire the wide-range anti-air cannons to take down your enemy attack bombers, and heavy armor-piercing cannons to deal with enemy tanks and jeeps. You generally play each map several times, with modifications to make it harder. The waves of enemies grow longer, with more enemies in each. More waves appear in each level, and harder enemies show up more often. More pathways open up for the enemies to take, and the layout of circles where you can place your soldiers changes. Even when three levels take place on the same map, the gameplay changes every wave. Initially you'll find the game to be quite challenging. You don't have the money to hire enough soldiers for a total victory, and upgrades are few and far between. As you complete each level, however, you earn stars. These stars can be used to unlock upgrades for your units. Each time you place a unit, it needs to kill enough enemies to gain a level, where you can spend money to upgrade them. The more upgrades you have unlocked, the more powerful individual units can become. At the end of each level, you have the option to save three units for use in the next level. Saving a unit keeps its experience level, so you need only earn the gold to buy its upgrades again. You can even spend stars to increase the number of units you can save. On top of that, saved units are less expensive to place and upgrade than freshly-purchased units. Don't forget to keep an eye on your towers, because they can take damage and they will die if you let them. 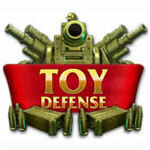 Toy Defense is a great choice for fans of the tower defense genre. For a casual game, it is actually quite difficult. While there are only 48 levels, you will end up playing and replaying them to earn higher ranks and more stars. It's nearly impossible to perfect a level on your first try, simply because you don't have enough upgrades. Veterans of the tower defense genre may be tempted to invest heavily in a few powerful towers, but Toy Defense definitely encourages filling every space with soldiers. Developing your own strategy and exploring the upgrade trees is heavily encouraged. Sixteen achievements are built into the game as well, giving you something to work for aside from simply beating every level. For an inexpensive game, it has a surprisingly robust amount of content.